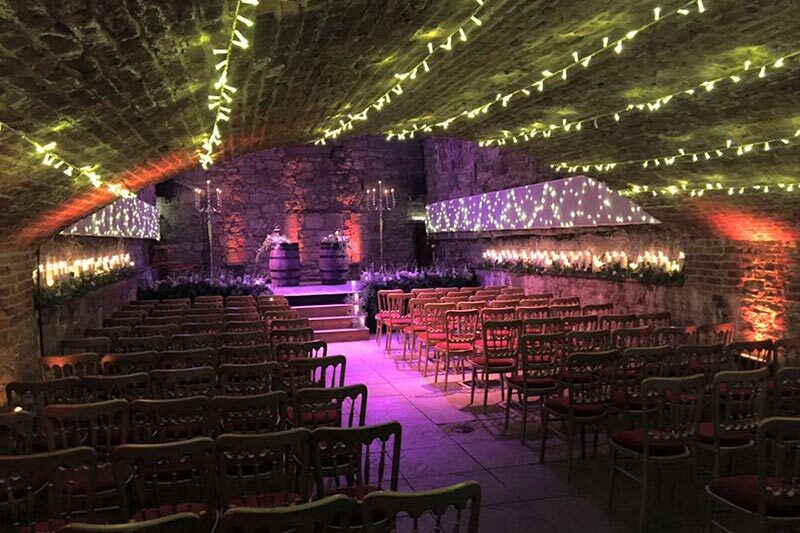 If you are looking for unique wedding venues in Scotland, especially in our nations capital, then The Caves Edinburgh is definitely worth your consideration. Located just minutes from the Royal Mile and part of the Unusual Venues of Edinburgh Group, this UNESCO World Heritage Site provides the perfect backdrop for a wedding with a difference. It has a series of entertaining rooms, the largest of which is the Main Vault, and comes complete with two bars and kitchen facilities. Let’s take a closer look at what a Caves Edinburgh wedding would be like. 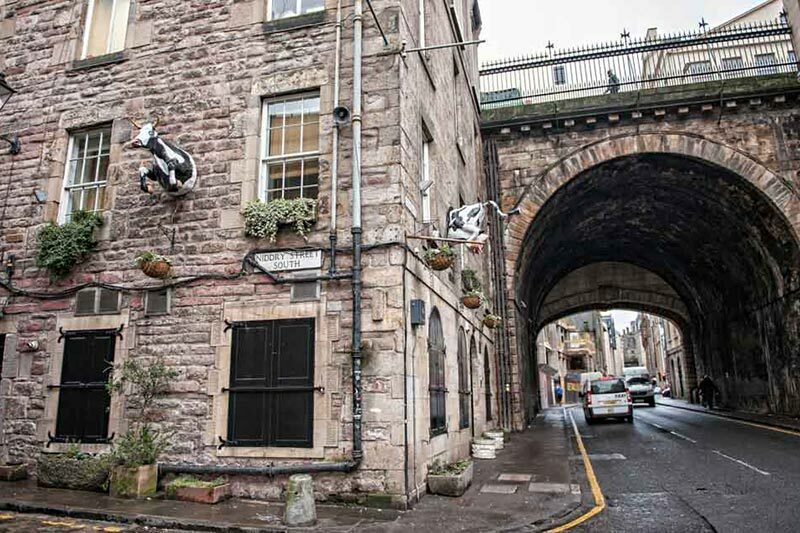 There is certainly a concentration of unusual wedding venues in Edinburgh. Probably because the Old Town has developed over hundreds of years, with layer upon layer of historic construction. 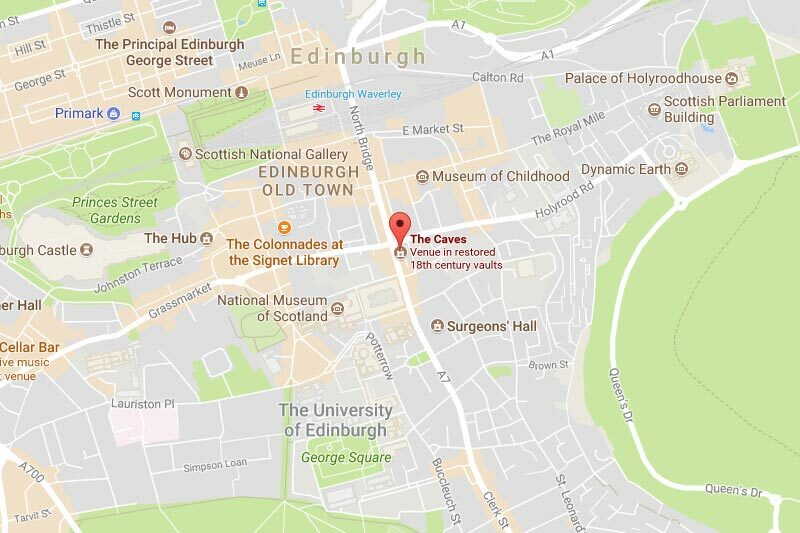 The Caves Edinburgh is located on Niddry Street South, a stones throw from the Royal Mile and no more than a 10 minute walk from Edinburgh Castle. Of course this central location means that on street parking is fairly limited. However there is a long stay NCP carpark just off Holyrood Road, which is only a few minutes walk away. Large vehicle access is also possible, if you would like to put on coach transportation for your guests. 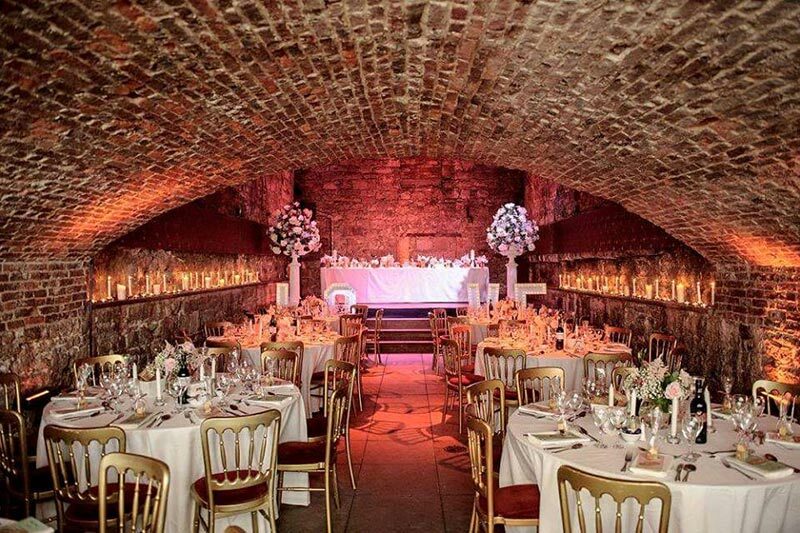 The good news is that The Caves Edinburgh is an exclusive use wedding venue, so you will get the entire place to yourself. The bad news is that it’s also a Fringe venue, which means you cannot hire it during August. In terms of atmosphere, you will find yourself nestled in the depths of the 18th century South Bridge. And as the name suggests, the venue is cavernous in its theme. It’s the perfect place to light some candles and create a nice romantic environment. And of course you can walk out the door and be stood in the heart of Edinburgh’s Old Town. The Unusual Venues of Edinburgh Group is actually a family run business, so you can expect a more personal experience. They rescued and restored this old Whisky store, on what was once called Whisky Row, retaining many original features plus adding modern technology such as state of the art lighting and sound. The original wooden floors are complemented by antique Chesterfields, and the wallpaper is made from clippings dating back to the 1700s. Access is granted on the day at 11:30am, although smaller items can be dropped off the day before. And you will need to remove all personal items at the end of the night, however large items can be picked up the next day. You will also be allocated a dedicated wedding coordinator, who will be present until the start of your meal when the evening manager takes over. 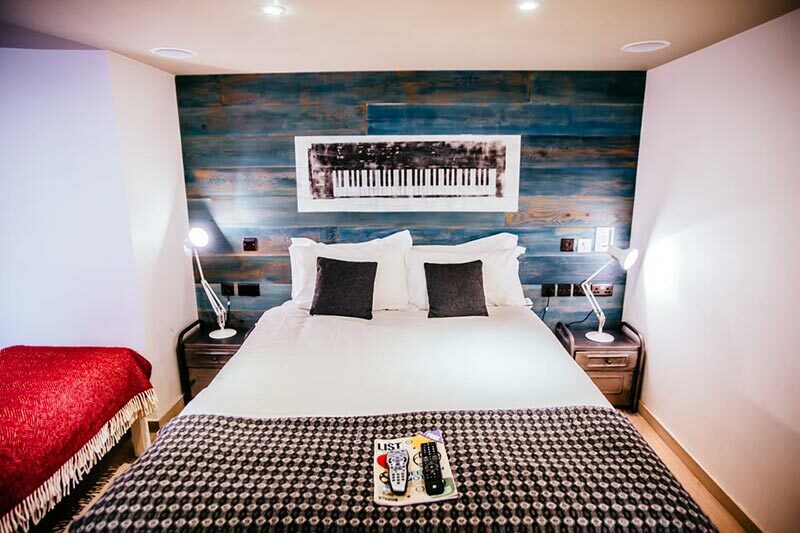 As you can imagine there is no onsite accommodation available at The Caves Edinburgh. Although The Cow Room can be turned into a private area for the Bride, where you can store gifts and perhaps change clothes. 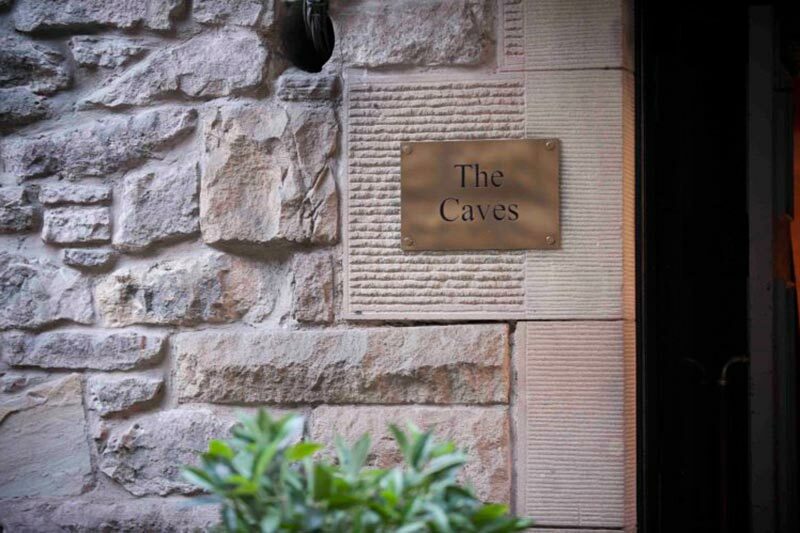 For hotels near The Caves Edinburgh you will quite literally be spoilt for choice. The Grassmarket Hotel, The Balmoral, The Inn On The Mile, and The Scotsman Hotel all come highly recommended. And you may also be able to get preferential rates at the Stay Central Hotel. 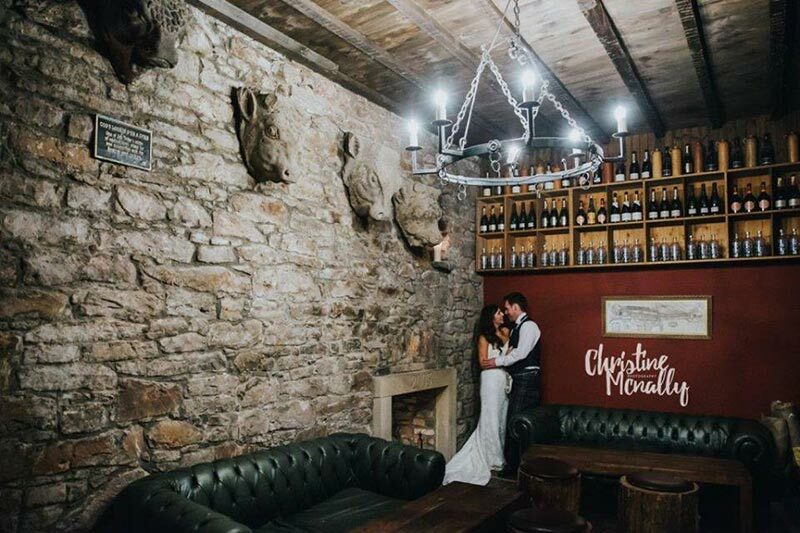 Not everyone chooses to have their wedding at The Caves Edinburgh. However religious, civil, and humanist ceremonies are all welcome. It’s the Main Vault where weddings normally take place, where you can comfortably seat 120 guests. Even more if you use the Balcony area. Your guests will be wowed by the raw stone work and atmospheric lighting. All you need to do is add some candles, and you’ll have a nice romantic atmosphere. Your drinks reception can be had in the upstairs Gentleman’s Lounge, where your guests will be able to explore the upper level. Followed by your dinner reception in the Main Vault, which can seat up to 120 guests on round tables. There’s a small stage at one end of the room, which is perfect for an elevated top table. And you can also seat a further 30 guests on the Balcony, which overlooks the Main Vault, taking the maximum capacity to 150 guests. Included in your wedding package are tables, chairs, linen, crockery, cutlery and glassware. 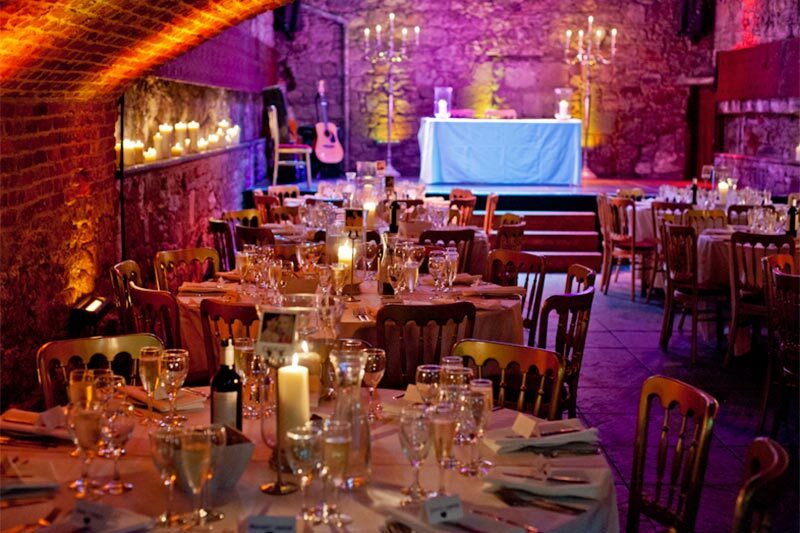 The catering is handled internally at The Caves Edinburgh, by their head chef Colin Grieve. Colin has over 20 years of experience working at some of Edinburgh’s finest restaurants. Whether you are looking for a formal sit down meal or perhaps a more relaxed banquet, a selection of dishes have been created using fresh locally sourced ingredients. There are great choices for vegetarians and children too. When it comes to the booze there are two bars, one on each floor. And your guests will be able to pay by both cash and card. There is no corkage option. Once you have finished your meal, the tables and chairs can be rearranged to transform the Main Vault into a brilliant dance floor. The stage is the perfect place to put the band, and the acoustics and atmosphere are fantastic. You can even fit up to 450 people into this space. There’s no need to worry about the celebrations ending early either, as The Caves Edinburgh has a license until 2am. It can be extended to 3am for an additional £180 too. Wedding photos at The Caves Edinburgh are going to be that little bit more challenging. A lack of natural light will mean you will need a wedding photographer who excels when using a flash. Fortunately Niddry Street South is a private road, so you will have a nice outdoor space to make use of. And with the Royal Mile just around the corner, Edinburgh’s historic landmarks can be used as incredible backdrops. 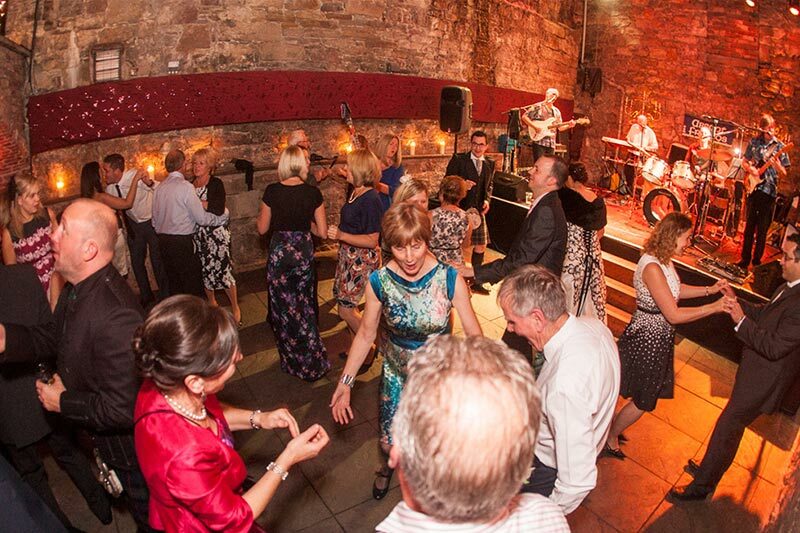 For accurate The Caves Edinburgh wedding prices, you should contact the venue directly. 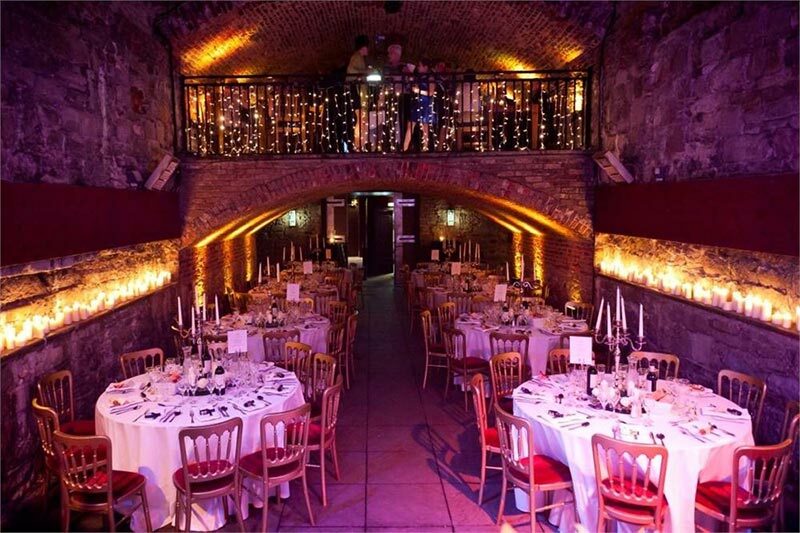 Exclusive use of The Caves Edinburgh (ceremony & reception), price £2,530 (minimum of 100 guests on weekends). Wedding Breakfast, prices from £47 per person. Drinks Packages, prices from £19.50 per person. 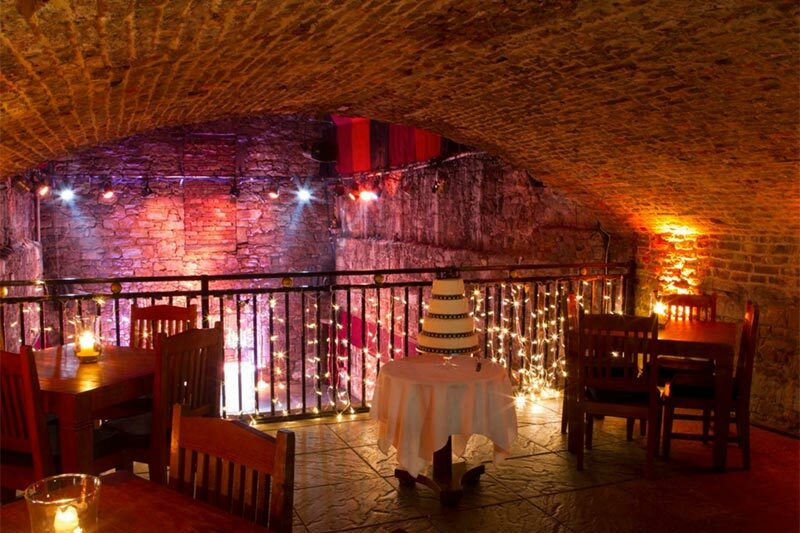 So those are my 10 reasons you should consider The Caves Edinburgh as your wedding venue. 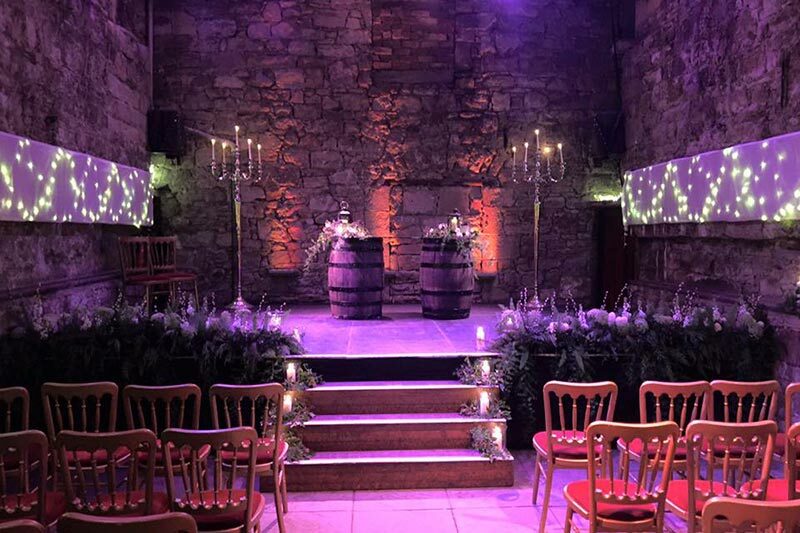 However if you are looking for a UNESCO World Heritage Site, right in the heart of Edinburghs Old Town, with unusual ceremony and reception spaces, and first class catering; then The Caves Edinburgh just might be the place for you. You can also find The Caves Edinburgh’s website here.